Within walking distance to Salems historically significant attractions is the Salem Waterfront Hotel and Suites. Our exemplary amenities include the award winning Regatta Pub, and indoor heated pool and fitness facility. Nearby marina and ferry services allow access by boat or car. The Salem train station is also within walking distance. 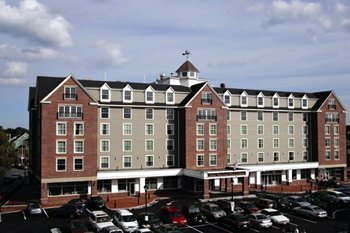 The Salem Waterfront Hotel and Suites is located 25 minutes north of Boston on historic Pickering Wharf. An eclectic vibrant harborside village, Pickering Wharf is home to unique shops, restaurants and marina services. We are also walking distance to Salems historically significant attractions including the Peabody Essex Museum and The House of Seven Gables. Our nearby marina allows guest to visit by boat or car. Train and ferry services to Boston are also nearby.